In the wake of Rhonda Byrne's bestseller The Secret, Carol Dekkers examines whether the theories behind Byrne's blockbuster can be applied to software development. Can the Law of Attraction and positive energy really be all it takes for successful, positive project results—or is that just wishful thinking? Whether you're being admonished for having more than ten items in the express lane at the supermarket or you are telling off a tester for missing a bug, at some point we've all been on the giving and on the receiving end of The Lecture. We're all human and fallible. Isn't there a more effective (and mature) way to communicate when a problem arises? If you've ever popped a CD into a drive and run an install for software you're about to test, then you might be performing installation testing indirectly. If not properly installed, an application could give false results for all other testing. A better strategy is to test the install process directly, which will give you greater confidence in the quality of your software. Think you know what your customer wants? Can you afford to be wrong? Based on the concept of tracer ammunition, which allows a shooter to follow the path of a bullet toward its target and adjust his aim as needed, tracer bullet software development can help you better understand your users’ wants so you can build a product that hits the mark. Sometimes the only way to get a fire under control is to call in the smokejumpers. These specially trained firefighters parachute into a region to take on a blaze and contain it before any more damage is done. 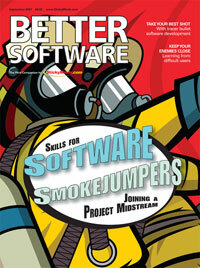 Some software development projects have smokejumpers, too. These professionals enter struggling projects midstream, assess the situation, and hopefully lead the team to a successful outcome. Mom always said, "If you can't say something nice, don't say anything at all." But Michael Bolton made an interesting discovery when he asked testers to talk about users they don't like. While nobody likes a complainer, listening to what your users are saying--even if you don't like it--can help you spot problems you may have overlooked. What do you do when your boss tells you to do something your conscience won't allow? Follow a test manager as she is faced with an ethical dilemma that forces her to pick between what is right and what will save her job. It's a tough position to be in, find out how to come through it with your head held high. Good code is a beautiful thing--especially when you don't have to write it. While most of us are quick to use prepackaged containers such as vectors, lists, and maps in everyday programming, we often overlook algorithms as a reuse tool. Find out how standard template library algorithms, specifically, can put you on the road to reuse.